Throughout my career as a motorcycle crash lawyer, one of the interesting facts I have learned is that most of my clients care as much, if not more, about their motorcycles than they do about the personal injuries they have suffered from their motorcycle accident. Among the first things I hear is that one of the primary reasons they choose me over other Pennsylvania motorcycle crash attorneys, is because I ride and they want someone who speaks their language. When it comes to making sure their motorcycle is fixed to their specifications and satisfaction, my riding experience is especially valuable. 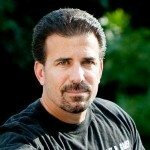 Call Pennsylvania motorcycle crash lawyer Lee Gaber at 888-292-5352 for a free cycle damage consultation. I have always felt that one of my greatest strengths as a Pennsylvania motorcycle accident lawyer is the fact that I’m also an avid rider. This passion gives me two big advantages when it comes to fighting for the most favorable recoveries possible for my clients. First of all, I understand the dynamics of riding a motorcycle. Facts and physics are unforgiving when the rubber leaves the road as a result of trying to avoid a crash. A deeper understanding of the complex interplay of gravity, forward momentum, friction, and centrifugal force comes in handy when trying to explain and prove what went down when another driver causes you to crash. Secondly, I feel the same intense attachment to my bike that you feel toward yours. I know that many of my clients are more upset about damage to, or the loss of their bike than they are about the injuries their very bodies sustain. And I totally get that because I’ve been riding the same custom Harley since 2002! It’s more like an extension of my body at this point than a separate machine. It is customized to my specifications and most importantly I know its history. So rest assured, I fully understand the emotional attachment that forms between a biker and his motorcycle. My broken leg and road rash will heal over time. I need to get my bike fixed now! 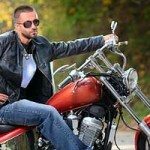 By hiring a Pennsylvania motorcycle accident lawyer who rides and has been most of his life, you can be sure that I understand what you mean when you explain that your “Triple Tree is bent” or when you want to get another “screaming eagle”. Not all motorcycle accident lawyers know these things, and it can cause a real communication issue when discussing your expectations. I also know how important it is for you to obtain the most favorable recovery as quickly as possible! Riding seasons are short in Pennsylvania! I can be reached at 888-292-5352 for a free consultation in Pennsylvania motorcycle accidents. You would think recovering property damage would be one of the more straightforward tasks involved in Pennsylvania motorcycle accident settlements. Your bike is damaged; it wasn’t your fault. You get the bike repaired and the insurance company reimburses you. Here’s a quick primer to help you get ready to fight for the best property damage recovery possible, and to understand how the process works. Repair or replace the bike? Sadly for those of us who develop emotional attachments to our bikes, the decision to repair, replace, or reimburse isn’t up to the owner. It’s up to the insurance carrier. They get to decide whether or not it is economically practical to repair your bike, or whether it makes more sense to reimburse you the “Fair Market Value,” of the bike. Now that sounds pretty good on the surface, but dig a little deeper and you realize that this means that a paper pusher in a cubicle somewhere gets to decide the Actual Cash Value (ACV) your motorcycle held on the day of the accident. If they determine that it will cost more to repair the bike than the so-called ACV, they will reimburse you for your damaged bike. In essence they will buy the bike from you. Your only option should you wish to keep the bike is to get a salvage title and pay them the salvage value of the bike. Furthermore, many insurance companies will automatically total a motorcycle if the appraised damages equal 80% of the bike’s ACV because once repairs are initiated, additional “hidden damages” are often found which would push the repair cost higher than the ACV. How is this so-called Fair Market Value determined? Fair Market Value is calculated by using newspaper and craigslist ads, Auto Trader and other similar sources to determine what your bike, or one similar to it, is currently selling for on the local retail market. The bottom line is that the insurance companies will be trying to minimize their outlay by minimizing the cash value of your bike. I’ll fight to maximize the value! Can they repair the bike with used parts? The insurance carrier’s obligation is to return your bike to its pre-accident condition. So if your bike is 5 years old, the mechanic can use refurbished or reconditioned parts for the repairs. If the mechanic is using newer parts, the insurance carrier may not be liable for this so-called “betterment,” and you will have to pay any difference in cost for the newer parts. This holds even if the issue is simply that no older parts are available. Do not use the insurance company’s recommended mechanic. An insurance adjuster will recommend that you use one of their trusted mechanics to repair your bike. Remember, in this situation, the mechanic is trusted by the insurance company, not you! That’s because the insurance carrier’s mechanic will be trying to save the company’s money anywhere he can, which can lead to corner cutting and lingering mechanical and cosmetic problems. Insurance companies cannot force you to use a particular mechanic. Find someone you trust to make an honest assessment of your motorcycle’s condition. Can you recover costs of my other gear? Yes! 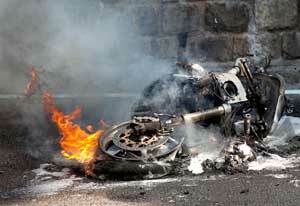 Any items you had with you on the bike that were damaged is considered property damage that can be recovered. This may include helmet, gloves, jacket, chaps, boots, mobile phones, computers, and other cargo. Once you make the choice to hire me as your motorcycle lawyer to handle your motorcycle accident claim, and I have a complete understanding of your situation, I get to work immediately to get you the most we can in an accident settlement. I first make sure your bike is fixed and you receive compensation, not only for your motorcycle but for any and all personal items that may have been damaged. We can make claims for include items such as your helmet, boots, glove, jacket, etc. – even items like a mobile phone, jewelry and glasses are recoverable. We don’t just stop at property damage, you can also hire Lee as your motorcycle attorney to recover lost wages, and money to cover your pain and suffering. Best of all, although we will make sure your motorcycle is fixed or replaced, we are motorcycle accident lawyers who never charge a fee for taking care of any of the property damage for you. Every Pennsylvania motorcycle accident claim we handle is always done on a contingency basis, meaning that unless we are successful in obtaining a recovery we don’t get paid! We only get paid once we obtain a settlement for you. This is true for each and every motorcycle accident victim we represent. This is just one more reason you can be sure that when you hire the motorcycle accident lawyers at our law offices, you are guaranteed that we are always ready, willing, and able to vigorously represent you to achieve a successful result. So contact Pennsylvania motorcycle accident attorney Lee Gaber without any reservations.